Deep vein thrombosis (DVT) is one of the major medical problems affecting 2.5 million people in the United States each year with an incidence of approximately 1 per 100. Incidence of DVT in India is not known. In kidney transplant recipients (KTRs), there is an imbalance of the hemostatic system, leading to persistent hypercoagulable state and increased risk of thrombotic diseases., The reported incidence of DVT in KTRs is between 1.6% and 8.3%., Ipsilateral DVT in a KTR can lead to allograft loss, graft rupture, and death., DVTs have been conventionally treated with anticoagulation, but the use of retrieval filter in the early posttransplant period is not common. Here, we report a case of KTR, who developed ipsilateral acute iliofemoral DVT, which was treated successfully with anticoagulation and inferior vena cava (IVC) filter placement. A 38-year-old male with end-stage renal disease secondary to presumed chronic glomerulonephritis with a dialysis (hemodialysis) vintage of 36 months underwent deceased donor renal transplantation with the graft kidney transplanted into the right iliac fossa with the graft vessels being anastomosed to the internal iliac vessels. He received antithymocyte globulin for induction (2 mg/kg) and was maintained on triple immunosuppression with tacrolimus, mycophenolate mofetil, and steroids. There were no intraoperative complications. Postoperatively, he had delayed graft function (DGF) and underwent five sessions of hemodialysis. In view of DGF, transplant kidney Doppler was done, which was normal, and he underwent allograft renal biopsy on postoperative day (POD) 5, which showed the presence of acute tubular necrosis and no evidence of rejection. His serum creatinine decreased from a peak of 5.4 mg/dl on day 5 to discharge creatinine of 1.8 mg/dl on day 15. The patient had no history of leg edema or pain. All laboratory values and imaging studies of the renal vessels before transplant, including prothrombin time, activated partial thromboplastin time, and international normalized ratio (INR), were within normal limits. The patient had a steady improvement in graft function, with creatinine improving to 1.8 mg/dl by POD 15 and hemoglobin of 10.8 g/dl. One month posttransplant, the patient developed gradual swelling of the right lower limb, which was extending from the right thigh to the foot, with no erythema or local rise of temperature. Doppler of the right lower limb was done which revealed the presence of a DVT involving the right external iliac, common femoral, and proximal superficial femoral veins [Figure 1]. 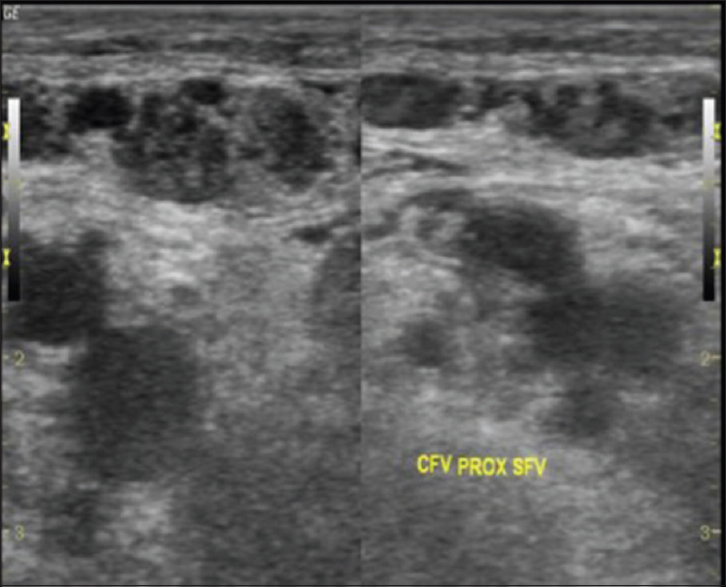 Although venography is the gold standard for confirmation of DVT, we used duplex Doppler ultrasound to confirm the diagnosis of DVT. Venography was not done in view of posttransplant status with DGF and the risk of contrast-induced nephropathy. There was no evidence of cytomegalovirus (CMV) infection with the CMV DNA polymerase chain reaction in blood showing undetectable copies, while his preoperative serology was IgM negative and IgG positive. Serum homocysteine levels were mildly elevated at 20.43 μmol/l and he was started on folic acid supplements. His workup for antiphospholipid antibodies (APLAs) was negative, as also antinuclear antibodies. Another workup for procoagulant statuses such as protein C, protein S, and Factor V Leiden mutations could not be done due to logistic reasons. The patient was started on intravenous unfractionated heparin 5000 units 8th hourly and was planned for IVC filter. He underwent fluoroscopy guided placement of retrieval filter in the infrarenal IVC through the right internal jugular vein. Unfractionated heparin was continued intravenous up to 48-h postfilter placement and then overlapped and switched to oral acenocoumarol 2 mg once a day. He was discharged after 2 weeks with decrease in edema of the right leg, a urine output of 6 l/day, serum creatinine of 1.1 mg/dl, and hemoglobin of 11.2 g/dl. His anticoagulation was adjusted to maintain INR between 2 and 2.5. At 3 months postoperative, the patient is stable with no limb edema and serum creatinine of 0.8 mg/dl. A follow-up venous Doppler demonstrated the resolution of the thrombus. 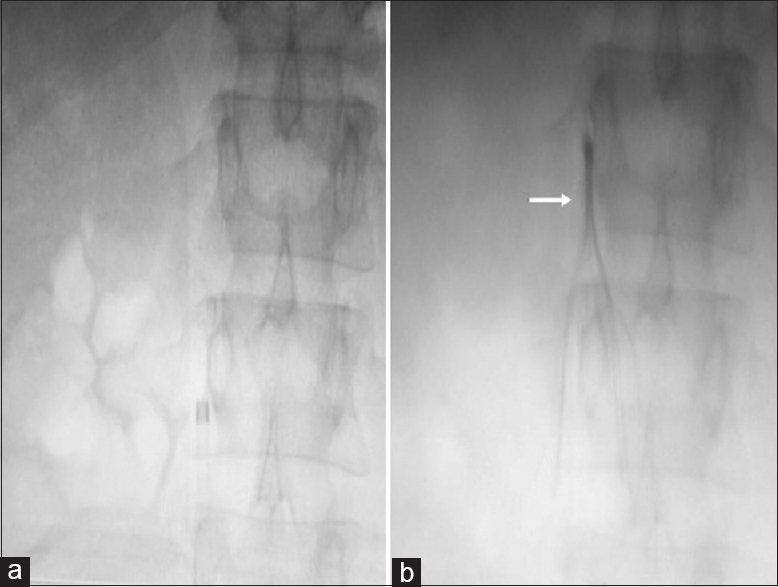 Fluoroscopy pictures confirmed the position of the IVC filter [Figure 2]. More than 90% of the DVT in general surgical patients occur within the 1st week after surgery. Most of the early thrombotic events that occur in this setting can be attributed to technical failures, external compression, preexisting asymptomatic DVT, or thrombophilia. In our case, the patient developed DVT 30 days after the procedure although there was no apparent risk factor. In a study by Humar et al., the authors reported that more DVT episodes were seen in the 3rd–5th month after transplant. They also observed that in the initial month posttransplant, the risk of DVT was more than two times higher on the side of the graft surgery, in accordance with the risk due to local surgical manipulation. However, over the time frame of study, the risk equalized on both sides, suggesting that the later risk was not related to surgical factors. The cause of hypercoagulable state in KTRs is multifactorial. It includes the use of immunosuppressive agents, presence of APLAs, native kidney disease, and infections. Among the immunosuppressive drugs, the use of steroids, cyclosporin, and sirolimus has been shown to be associated with increased risk of thrombosis, while few studies have demonstrated a decreased risk with tacrolimus. The KTRs with DVT should also be evaluated for APLAs whose incidence has been reported to be as high as 28.1% in a report. The native kidney disease of the patient also plays a role, with patients having lupus nephritis (due to APLAs) and Fabry's disease having increased risk of thrombotic events. There is growing evidence that homocysteine is associated with increased thrombotic risk, and the levels of homocysteine have been found to be elevated in KTRs, with one study reporting a prevalence of about 70%. Another risk factor to consider is the posttransplant polycythemia. It has been assumed that as the hematocrit increases, the risk of DVT increases. However, a study by Verhave et al. showed that anemia was associated with increased risk of DVT. The authors suggested that this could probably reflect an increased state of inflammation leading to anemia and DVT. Nephrotic syndrome developing posttransplant is also an established risk factor for DVT, as it promotes a procoagulant milieu. Our patient was successfully treated with anticoagulation and placement of IVC filter. We did not proceed with thrombolysis in view of recent transplant surgery. Many authors have reported thrombolytic therapy as the treatment of choice for acute DVT in KTR. It is clinically effective in approximately 85% of the patients. However, the incidence of hemorrhagic complication is approximately 10%. Recent surgery is a relative contraindication for thrombolytic therapy. Surgical thrombectomy is also an option but can be associated with significant perioperative risk of pulmonary embolism and high risk of DVT. In patients with DVT, IVC filter has been used in high-risk patients to prevent pulmonary embolism. The filter can be placed either through a femoral approach or a right jugular venous approach depending on the position of the thrombus. Here, IVC filter was placed in the infrarenal IVC through internal jugular approach. Acute iliofemoral DVT is a rare event after renal transplant. We report a case of early postrenal transplant acute iliofemoral DVT, which was successfully treated with anticoagulation and IVC filter placement. Venography, thrombolysis, and thrombectomy pose challenges in the KTRs because of increased risk of adverse effects such as bleeding, contrast-induced nephropathy, and pulmonary embolism. Prandoni P, Lensing AW, Cogo A, Cuppini S, Villalta S, Carta M, et al. The long-term clinical course of acute deep venous thrombosis. Ann Intern Med 1996;125:1-7. Malyszko J, Malyszko JS, Pawlak K, Mysliwiec M. The coagulo-lytic system and endothelial function in cyclosporine-treated kidney allograft recipients. Transplantation 1996;62:828-30. Irish AB, Green FR. Environmental and genetic determinants of the hypercoagulable state and cardiovascular disease in renal transplant recipients. Nephrol Dial Transplant 1997;12:167-73. Abualhassan N, Aljiffry M, Thalib L, Coussa R, Metrakos P, Hassanain M, et al. Post-transplant venous thromboembolic events and their effect on graft survival. Saudi J Kidney Dis Transpl 2015;26:1-5. Humar A, Johnson EM, Gillingham KJ, Sutherland DE, Payne WD, Dunn DL, et al. Venous thromboembolic complications after kidney and kidney-pancreas transplantation: A multivariate analysis. Transplantation 1998;65:229-34. Ramirez PJ, Gohh RY, Kestin A, Monaco AP, Morrissey PE. Renal allograft loss due to proximal extension of ileofemoral deep venous thrombosis. Clin Transplant 2002;16:310-3. Goldman MH, Leapman SB, Handy RD, Best DW. Renal allograft rupture with iliofemoral thrombophlebitis. Arch Surg 1978;113:204-5. Joffe SN. The incidence of postoperative deep vein thrombosis. Thromb Res 1975;7:141-8. Allen RD, Michie CA, Murie JA, Morris PJ. Deep venous thrombosis after renal transplantation. Surg Gynecol Obstet 1987;164:137-42. Ozsoylu S, Strauss HS, Diamond LK. Effects of corticosteroids on coagulation of the blood. Nature 1962;195:1214-5. Vanrenterghem Y, Roels L, Lerut T, Gruwez J, Michielsen P, Gresele P, et al. Thromboembolic complications and haemostatic changes in cyclosporin-treated cadaveric kidney allograft recipients. Lancet 1985;1:999-1002. Babinska A, Markell MS, Salifu MO, Akoad M, Ehrlich YH, Kornecki E, et al. Enhancement of human platelet aggregation and secretion induced by rapamycin. Nephrol Dial Transplant 1998;13:3153-9. Muraki T, Taka T, Noguchi T, Ishii H, Seki J, Yamamoto J, et al. Effects of cyclosporine and FK506 onin vitro high shear-induced platelet reactivity in rat and human non-anticoagulated blood. Transplantation 1998;65:1132-4. Ducloux D, Bourrinet E, Motte G, Chalopin JM. Antiphospholipid antibodies as a risk factor for atherosclerotic events in renal transplant recipients. Kidney Int 2003;64:1065-70. Thervet E, Anglicheau D, Legendre C. Recent issues concerning renal transplantation in systemic lupus erythematosus patients. Nephrol Dial Transplant 2001;16:12-4. Friedman GS, Wik D, Silva L, Abdou JC, Meier-Kriesche HU, Kaplan B, et al. Allograft loss in renal transplant recipients with Fabry's disease and activated protein C resistance. Transplantation 2000;69:2099-102. Ducloux D, Motte G, Challier B, Gibey R, Chalopin JM. Serum total homocysteine and cardiovascular disease occurrence in chronic, stable renal transplant recipients: A prospective study. J Am Soc Nephrol 2000;11:134-7. EBPG Expert Group on Renal Transplantation. European best practice guidelines for renal transplantation. Section IV: Long-term management of the transplant recipient. IV.9.3. Haematological complications. Erythrocytosis. Nephrol Dial Transplant 2002;17 Suppl 4:49-50. Verhave JC, Tagalakis V, Suissa S, Madore F, Hébert MJ, Cardinal H, et al. The risk of thromboembolic events in kidney transplant patients. Kidney Int 2014;85:1454-60. Biesenbach G, Janko O, Hubmann R, Gross C, Brücke P. The incidence of thrombovenous and thromboembolic complications in kidney transplant patients with recurrent glomerulonephritis is dependent on the occurrence of severe proteinuria. Clin Nephrol 2000;54:382-7. Graor RA, Young JR, Risius B, Ruschhaupt WF. Comparison of cost effectiveness of streptokinase and urokinase in the treatment of deep vein thrombosis. Ann Vasc Surg 1987;1:524-8. Hirota S, Matsumoto S, Yoshikawa T, Tomita M, Kono M, Sako M, et al. Inferior vena cava filter placement for prevention of pulmonary tumor emboli of renal cancer with renal vein or vena caval tumor thrombus: Prophylactic usage prior to transcatheter arterial embolization. Radiat Med 1998;16:335-9.